Say hello to our Super Tooter Club kids! Ms. Kitty and the Super Tooter Club proudly welcome their newest members! Ms. Kitty is proud to announce 5th graders Aidyn, Amelie and Amer have joined the exclusive Super Tooter Club! They have joined Kyle (4th) and Ian (5th) who was the first to earn his black belt. 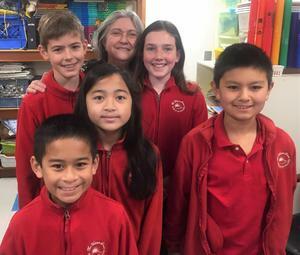 The students mentioned are certified Super “Tooter” Tutors, which means they are able to answer any questions and help other students earn their belts. When a student earns a belt, it comes with the responsibility of supporting and encouraging students at lower belts levels so that the whole team succeeds. Keep rising to the challenge and thanks for inspiring your peers!